I’ve had the pleasure of working with 50 clients so far on local SEO (as of very recently). The best part has been helping good people make some rain. The second-best part is I’ve been able to learn a lot and get better at what I do. Some of these relationships have been worth five figures to me, others three figures. Some projects have been smooth sailing, others more like go-karting through the Himalayas. But every single one has taught me something (or many things) about local search. 1. Local-search visibility should be a springboard – a launching pad. If you can get a bunch of customers as a result of it, put some of that money into building a better site or developing a good AdWords campaign (or both). You should also ask some of those customers to review you on third-party sites. Local SEO is most valuable when you use it to open up even more streams of potential customers. 2. If your business is right on the town line, make dead-certain you know which town the major data-providers “think” you’re in before you build any citations. 3. If your Google listing is fraught with bugs that you can’t figure out and that won’t go away, you may get pretty good results if you nuke the listing and start over. 4. Sometimes getting just one good lead from your Google listing more than pays for your investment in local SEO. 5. Things can get FUBAR for certain types of professionals (like real-estate brokers) who share a building and a street address with dozens of others in the same industry. 6. If you’ve built several “microsites” – each focused on a specific service you want to rank for – think twice before putting them in the “website” fields of your Google+Local listings. You probably won’t rank well for broader search terms – and even if you do, your highly-focused site will turn off most of your visitors. 7. It can sometimes take half a year to see results. It’s tough to be patient, but you’ve got to be. Easy come, easy go. But boy is it nice when the results finally do come through. 8. Having NAP information for a bunch of different locations on the homepage is totally fine. It’s great to have a separate page of your site corresponding to each location / Google+Local page, but by no means is it necessary to get great rankings. 9. Think hard about what to name your business, pick a name, and DO NOT change your mind later. 10. If you think it somehow looks “unprofessional” to ask customers/clients for reviews, be prepared to get stomped by your local competitors. If you’re a local-search pro, try to determine beforehand whether you might be working with someone who feels that way. 12. “I’d rather have it done right than done fast” is something every local-search pro loves to hear. Everyone’s happy. 13. It’s possible to have #1 local rankings and not get a single new customer as a result if you’re not serious about asking your customers for Google reviews. 14. Geography matters in competitive, big-city markets. You probably don’t need a downtown location, but if you’re on the city limits or ‘burbs you’d better think hard about which specific local areas you want or need to get visible in. 15. Doing a great job of getting customer reviews can make up for having a poorly optimized website…almost. 17. Realize that a webmaster who’s impossible to reach and located in another country can single-handedly bring your local SEO efforts to a screeching halt. 18. Google may very well spank you for using non-compliant categories in your listing – but will just as likely dust you off and give you a pat on the back once you fix the categories. 19. Bloody “MapMaker wars” are waged in some local markets. Avoid. 20. 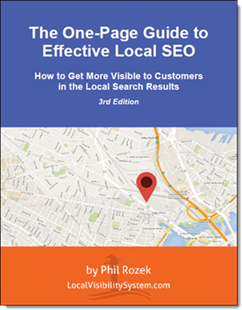 Getting to the top of local search for competitive terms in small-town markets is smart, doable, and profitable. 21. If you’re getting your business online for the first time in a ultra-competitive big-city market, you need to be above average in some way. If not through tons of client reviews, then through adding tons of relevant, helpful content to your site. Grow. Fine, grow slow…but grow. 22. Simply cleaning up all your citations and removing duplicate Google listings can work wonders. 23. Simply cleaning up the spammy internal anchor-text on your site can work wonders. 24. Get off your duff and list your business on LocalEze. Don’t put it off. And if you run into trouble verifying your listing with one email address, try another (Gmail accounts always seem to work). 25. If you’re ranking in the middle of the 7-pack but want to get to the top, don’t look for “clever techniques.” Revisit the basics. 26. Always err on the side of using a light touch when optimizing your Google listing and site. That may be all you need. 27. A homepage title tag with more than 70 characters is a problem. A title tag with more than 300 characters is a gift to at least 7 of your local competitors. 28. If you have multiple locations and Google+Local pages and a separate landing page for each, make the landing pages significantly different from each other. Don’t just swap out the city names. 29. As long as business is pretty good, many people won’t implement even simple suggestions for how to get a little more visibility and business. And that’s OK.
30. Some business owners have more money than God. And they may blow it on things that don’t help them one bit in local search. Many of them aren’t such tough competitors. 31. A keyword-stuffed description on your Google+Local page will not hurt your rankings. Repulse potential customers and make them leave your page, maybe. 32. The size of the “Service Area” you specify in your Google listing does not matter. 33. Just because your Google+Local page is stuffed with keywords and you don’t seem to have been penalized doesn’t mean your rankings won’t improve from cleaning it up a bit. 34. If you change your street address, expect good local rankings to take many months. Be pleasantly surprised if they come within a couple months. 35. If the last time you updated your site was in the year 2000, you may want to consider your local-search guy’s pleas and cries to make some changes to it. 36. Don’t have a bunch of nearly identical cookie-cutter pages geared toward every single town in your service area. Google no like. 37. If you’re a business owner, always tell your local-search guy or gal about any organic rankings you have before any of your landing pages are tinkered with. If you’re a local-search guy or gal, always ask about organic rankings. 38. Even business owners with #1 rankings in tough local markets are smart to get a local SEO audit. 39. When in doubt, re-read the Google Places Quality Guidelines. Especially the part about how service-based businesses need to “hide” their addresses. 40. Even if you’re in a tiny town, don’t “target” a bigger, farther-away town. You might be surprised at the number of eyeballs you get just by being truthful about your location. 42. Local-searchers disagree on many best-practices. Maybe that’s because there’s a ton we don’t know. Or maybe it’s because things don’t need to be perfectly optimized for a business to get highly visible. Or maybe both. 43. A watched pot never boils. Business owners and local SEOs need to expect the process to take a while. If you obsessively stare at your rankings and analytics stats every day, the temptation is too great to tinker and fiddle and mess things up. 44. If you’re in a huge metropolitan area, know exactly which ZIPs you’re visible in. Or else you can do everything really well and actually get a lot of local visibility but drive yourself bonkers thinking that you’re visible nowhere in the city. 45. Even highly proactive business owners who’ve put serious work into their sites will stuff keywords and footer links like it’s goin’ out of style, unfortunately. 46. Never forget Lessons 18 or 39 (having Google-compliant categories, and knowing when you must “hide” your address). 47. If you have many locations and one of them ranks really well, see how you can optimize the others to be more like the really visible one. 48. People love tweaking their title tags. Dealing with other important on-page factors: not so much. 49. Citation-building is more complicated forUS businesses than it is for businesses in other countries. 50. Business owners who’ve done local SEO for themselves or read up on it are usually great to work with. Fantastic list Phil! As always, it’s a pleasure to learn from your experiences and knowledge. Thanks for the feedback, Mike! Glad you liked it. Another hit-it-out-of-the-park post Phil! God I love your blog! Thanks for stopping by and for the super feedback, as always. And thanks in advance for the share. The Local Search Forum is the place to be! One hell of a post here! I love getting to see/find new sites on local seo. This was a really good read, unique and really interesting. I added you via Twitter. Hope to talk soon! Interesting post! Could you please explain #32 – have always wondered what Google does with the service area info, whether by miles or zip codes. Thank you! Great question. My understanding has always been that Google treats service area as just another “location signal” – which tells Google what geographical area you’re in. However, I haven’t found that it has more significance than that: if you’re in a fairly-competitive vertical (let’s say carpet-cleaning or roofing) and you’re located right between LA and San Diego, and you set your service area at a 60-mile radius, you simply will NOT be visible in both LA and San Diego. Think of it as a birthday wish-list you give to a stingy relative. You’ve got all this stuff on there that you’d like. No guarantee whatsoever you’ll get even most of it, though. And both you and the relative probably know that. But if the tightwad relative gets you anything, it will probably be something on your list – though you’re not sure exactly what it will be. Other people may have different experiences with specifying service area. The above is just what I’ve seen play out for client after client. Another excellent post Phil! I’m sure all us Local SEO-ers are nodding so much, our heads are falling off. Great list to look at before starting with a new client – good for avoiding too many potholes. Thanks for the compliments, mate! Thanks a bunch! Flattered that you thought it took me a long time to put this together, but it actually didn’t – at least not as much as some other posts. Bookmarked, will think about every advice for local SEO in France! Thanks, Baptiste! I don’t have a whole lot of local SEO experience for French businesses, but I’d love any insights you might have. Remarkable, sharing, honest post, Phil. Really impressed with your list! This was a pleasure to read. Thanks, Miriam! I’d really be interested in hearing any “lessons” you’ve learned from having worked with lots of local clients yourself. Thank you for the public information! It is good to see the local SEO community provide support and heads up to other people. When doing business citations, it is important to link the information with the local business listing. The location and city should be expressed in the information you provide the citation build company. I do agree that local citations is more difficult in the US market. I like the approach of individual pages for each location because it plays a role in traditional SEO saturation for the keywords and location. It helps the local listing when the first website page to the same business is below it. This can be achieved through local business citation building (the url address you provide). I definitely agree that one’s third-party listings should be as complete as possible. One shouldn’t just fill out “name, rank, and serial number” to get the citation, but rather also all the other service- and location-relevant fields. Having individual pages for each location is preferable, though in many cases I simply wouldn’t say it’s necessary. Kind of depends on a given client’s time and resources, IMHO. Phil: That is a terrific list. A lot of those points are worth writing about in greater detail. Ha Ha. Its a treasure trove of tremendous content. More power to you. Somehow the references to reviews got me to recall when I was a commercial real estate broker in a large market. My partner and I made an incredible deal on behalf of a client/tenant. 10 years afterwards there were 2 tenants in that building both of whom had made comparable leases around the same time period. All the tenants were leaving and the building was for sale. The sales package included current lease rates. Our client was roughly paying about 35% less per sq ft than the other comparable tenant. It was an incredible lease value and over the 10 year term saved our client several million dollars. I called on the tenant client and showed him the information. I was looking for a referral. The client/tenant was tight with praise. Never got the testimonial. Sort of not unexpected, knowing that client. So be it. A business can never stop asking for references and referrals. No matter how well you do, not everyone writes testimonials. Regardless, if you are doing a good job an SMB needs to continue to ask for them and get those that do rave about services. Terrific list. I’ve got to re read and ask questions on some issues, if you don’t start expounding on some of the points. Interesting story. I think one great truth you highlight is that it’s always a numbers game. Whether you’re asking for referrals, testimonials, reviews…whatever the case may be. Fire away with the questions. Who knows – if you have enough maybe I’ll do a “sequel”! I’m sure other people would want to weigh in on them, too. Thank you for this extremely useful post, Phil. “The Main Client-Related Problems a Local SEO can experience and how (pls be as specific as possible) to either avoid these, or at least greatly diminish the likelihood of them arising in the first place.” [granted, the title’s much too long, but you get the idea]. Would anyone else be interested in reading a post on that subject? Sure, there’s a lot of overly-broad advice out there, but not much specifically geared toward local-SEO projects – and potential providers and clients. If that’s something you’d be interested in, I assume others would be interested in it as well, and I might finish and publish the post sooner rather than later. Although I can’t speak for your other readers, I would be very happy to read that new post as soon as you can find the time to put it together. You got it, Ken! Thanks again for the “vote.” I should be able to publish before the end of the month (knock on wood :)). 2) Things that the Local SEO client can/should do? Yes, I do believe there would be benefit in having the two sections: in fact, that’s exactly how I’ve been outlining the post. You must have Spock-like powers of mind-reading! Again, thanks for the fantastic suggestion; for one thing, it reassures me that I’m putting the post together in a way that makes sense. Point 40. “Even if you’re in a tiny town, don’t “target” a bigger, farther-away town. You might be surprised at the number of eyeballs you get just by being truthful about your location.” – this is one that always plays on my mind. How far from the city do you need to be before you recommend targeting it? How small is the town, before you consider targeting the next ‘bigger’ town/city? Are there thresholds that you look at when considering what areas to target for a business? My interpretation is that it would depend on the service. E.g. takeaways are inherently going to be local, you don’t want to travel far to get quick food, whereas dentists – you might be willing to travel further. Thanks for the great post Phil! Great question. There’s actually not much you can do to “target” a town you’re not in – at least in the Google+Local results. For instance, as I’m sure you know, you can’t fudge your address, or throw the city name in the name of your Google listing, or include city names in your categories. So at least as far as Google+Local results are concerned, the name of the game is to get to the top of the heap in your town. If you play your cards really well – like by getting a ton of reviews from different sites – you may be able to scoop up some extra visibility in surrounding towns. But that’s something that you can neither count on nor engineer. To some extent, in terms of the size of the area you can rank well in, you need to let the chips fall where they may. How to reach the farther-away areas? By going after organic rankings, and throwing together a PPC campaign. I suggest Matt McGee’s post on creating unique location-specific landing pages. By the way, those pages can double as your landing pages for AdWords, if you choose to go that route. Thanks for the reply Phil, really appreciate it. Thanks for the link aswell, great read! That might result in somewhat lower rankings for the “town” – and probably wouldn’t be enough to rank you in the “city.” But that’s a complex question, and warrants a close look; there are a lot of factors here, and is another “I know it when I see it” situation. Glad to hear it helped, Michael. I wouldn’t offer a “no pay until you hit page 1” deal, though. Most people don’t value what’s given to them for free, and you’ll attract the wrong types.